Chabil Mar, Maya for “Beautiful Sea”, is The Only Guest Exclusive Resort on the Placencia Peninsula. A private boutique resort, Chabil Mar is a stroll along the beach to Placencia Village. Our guests partake of the Village restaurants, shops and nightlife at their leisure. Complimentary van service, bicycles, kayaks and paddle boards woo our guests to the sea and Belize culture that surrounds them. At Chabil Mar each of our 19 Villas and Honeymoon Suite, on this lushly landscaped property, is uniquely designed and furnished, appointed with original artwork, and include personal Caribbean-View verandas. Two infinity beach-side swimming pools, nestled in lush gardens, and 400 feet of private beach grace our tropical landscape. Privacy, luxury accommodations, on-sight Concierge and award winning service are yours! All Belize adventures and our premier location in Placencia Village result in one-of-a-kind “Barefoot Luxury” adventure vacation. Our one two–bedroom Luxury Partial Seaview have personal verandas facing the Caribbean and are situated on the first floor, 70 feet from the beach, steps away from either of our two infinity pools and nestled in lush tropical landscapes. The one-bed, one-bath Partial Seaview Villas have King-size bed with en-suite bathroom. This Luxury 1000 Square Foot Seafront Villa Suite is situated directly on the beach, on the first floor, and includes a wraparound veranda, offering uninterrupted views of the Caribbean, with table and chairs for your relaxation, enjoyment or private dining, if you choose. Our one bedroom Luxury Seaview Villas are situated on the second floor, have personal verandas facing the Caribbean and are setback about 70 feet from the beach overlooking one of our two infinity pools and the lush gardens, affording magnificent views of the Caribbean. The one-bed, one-bath Villas have King-size bed with en-suite bathroom. Our one bedroom Luxury Seafront Villas are situated on the beach, have personal verandas offering uninterrupted views of the Caribbean. The first-floor Seafront Villas have steps leading down from the veranda onto the beach and your awaiting sunlounger. The second-floor Seafront Villas offer an exclusive experience from your personal veranda, affording incredible views of the Caribbean and ideal for skies at sunrise and nocturnal views of the starry skies. The two-bed, two-bath Villas have a master bedroom with king-size bed and ensuite bathroom and a second bedroom with queen bed and adjoining bathroom. The one-bed, one-bath Villas have King-size bed with en-suite bathroom. Two-bedroom Villas, with loft space and 2 additional single beds, are available. 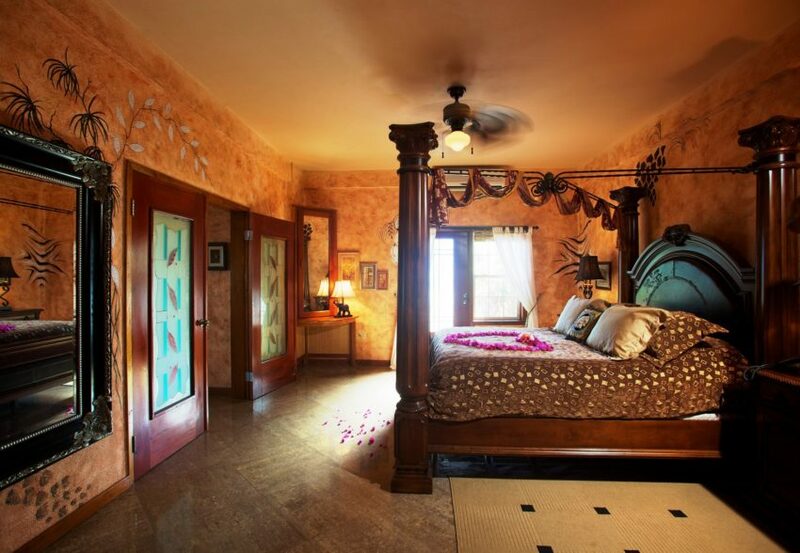 Each of these two Luxury Seafront Villas offer approximately 1200 square foot of living space, marble flooring and fine custom Belizean wood cabinetry, and, like all Luxury Chabil Mar Villas, has a main bedroom with King bed and en-suite bathroom, zoned air conditioning and ceiling fans. 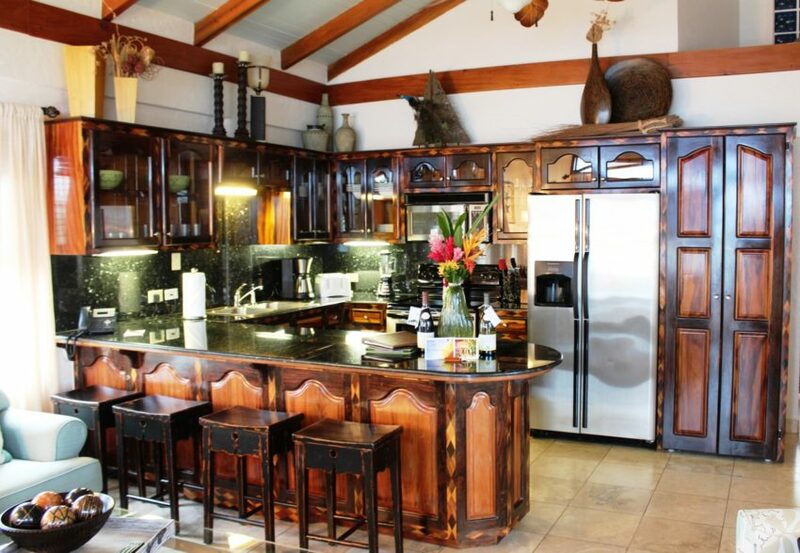 Each of these two Luxury Seafront Villas offer approximately 1200 square foot of living space, marble flooring and fine custom Belizean wood cabinetry, and, like all Luxury Chabil Mar Villas, has a main bedroom with King bed and en-suite bathroom, zoned air conditioning and ceiling fans. One of these Villas is on the ground floor and the other is on the second floor. 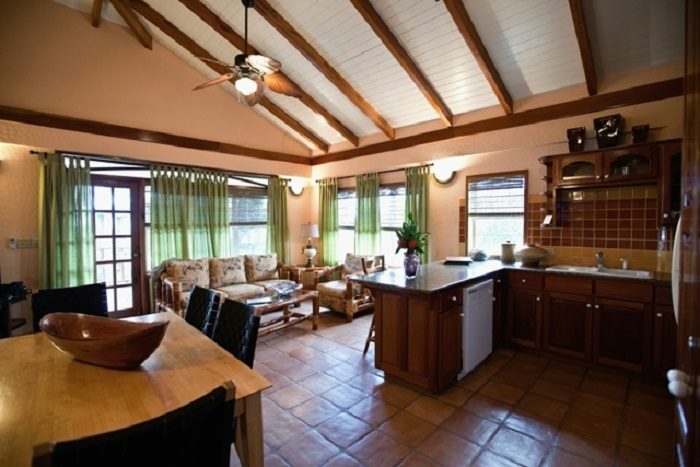 The ground floor Villa is a one-bedroom en-suite with grand master bedroom and custom four poster bed , while the second floor Villa includes two bedrooms and two baths and a grand living area.